135,860 solid organ transplants reported. 7.2% increase compared to 2015. 34,096 deceased organ donors in 2016. 6.5 % of increased compared to 2015. 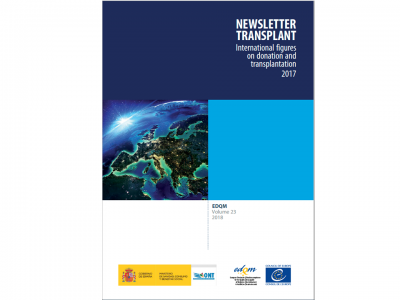 30,352 liver transplants performed in 2016. 9.3% increase compared to 2015. 7,626 heart transplants performed in 2016. 8.5% increase compared to 2015. 5,497 lung transplants performed worldwide in 2016. 8.9% increase compared to 2015. 2,342 pancreas transplants performed in 2016. This represents an increase of 1.9% in one year. to the GODT in 2016. The boundaries and names shown and the designations used on this map do not imply the expression of any opinion whatsoever on the part of the World Health Organization concerning the legal status of any country, territory, city or area of its authorities, or concerning the delimitation of its frontiers or boundaries. Dotted and dashed lines on maps represent approximate border lines for which there may not yet be full agreement. 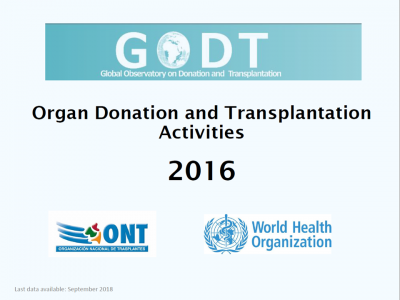 Data Source: Global Observatory on Donation & Transplantation.